Living Area 1871 Sq. ft. 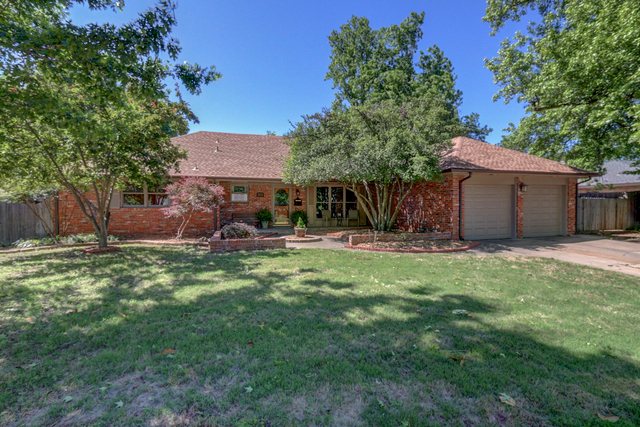 Lot Size: 12,825 Square Ft.
Beautiful Rancher in East Norman! Come check out this amazing home w/ original details & the perfect updates you'll love! The family room has a soaring vaulted ceiling w/ built-ins, a wood burning fireplace & is open to the kitchen. WOW have you seen the size of this kitchen! You will have plenty of room to cook & entertain. The kitchen features an island & separate bar area w/ an eat in area too. New granite counter tops, new pendant & can lighting, new vent hood & updated paint give this kitchen a fresh updated look. You will love to entertain in your second living area off the entrance that includes space for a large dining table. The master suite is quit spacious w/ double closets & bathroom w/ original tile. The secondary bedrooms are also very spacious with walk-in closets. The hall bathroom has a spacious vanity area & original tile as well. The laundry room is inside off the kitchen. PELLA windows & doors! HVAC replaced in 2012! Come make this awesome house your new home!